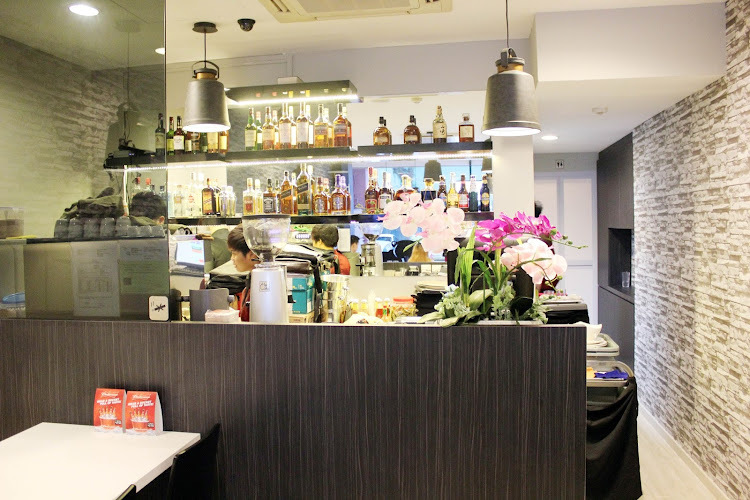 I was invited for a food tasting session at Big Bear Bistro & Bar along side at the streets of 2 Tan Quee Lan Streets (Just located opposite Nando's, Bugis Junction). This restaurant is located at an area where it's neighboring shops are steamboat restaurants and pubs. With it's simple exterior and fixtures, it is a perfect conducive cozy environment to dine with your families and friends because you will feel the sense of welcoming. Big Bear also offers cheap, affordable, home styled simple & comfort western food so you can enjoy dining at a soothing and relaxing environment. 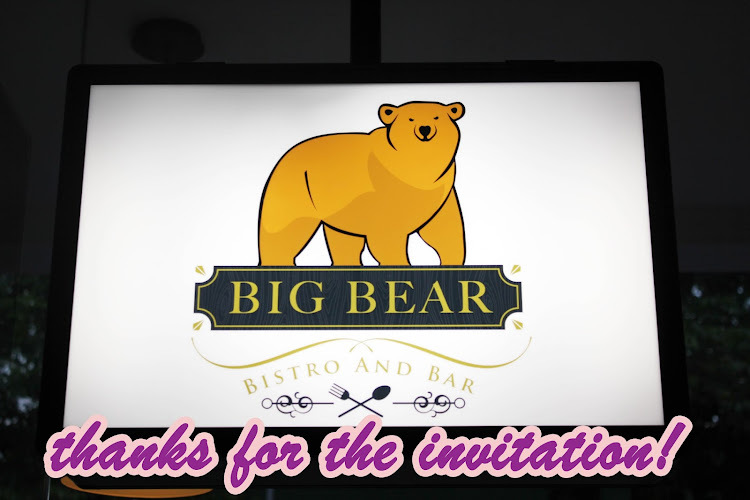 In an event, if you are searching for a restaurant where you can sit down and have a long chat with your friends, Big Bear Bistro & Bar is a place that you should consider in your list. They are kinda new to this street so let me show you some food that they offer here! 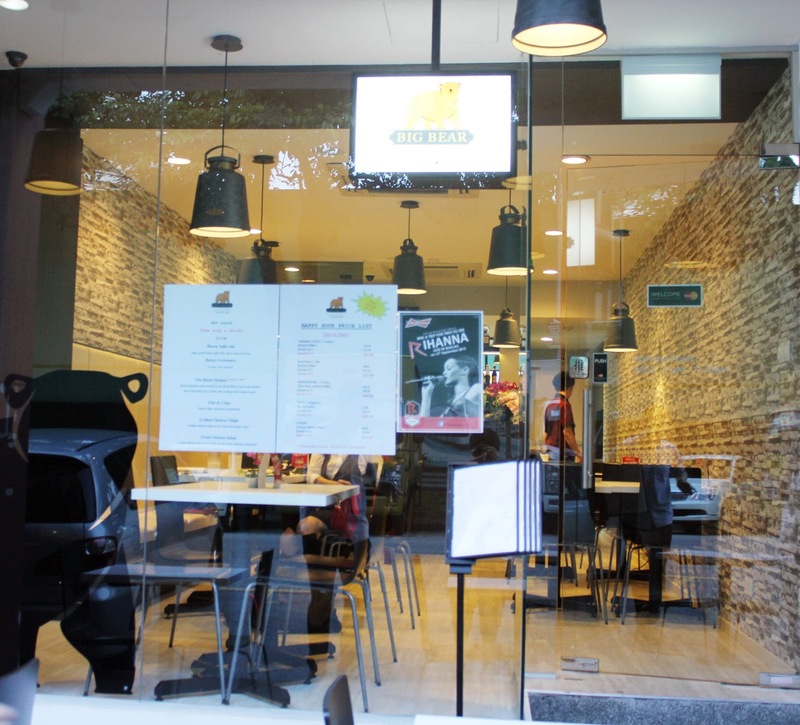 How the restaurant looks like from inside. This soup is extremely fragrant, I love the texture of the soup because it's not that starchy thus it was a good dish to build up my appetite before the other food is served. 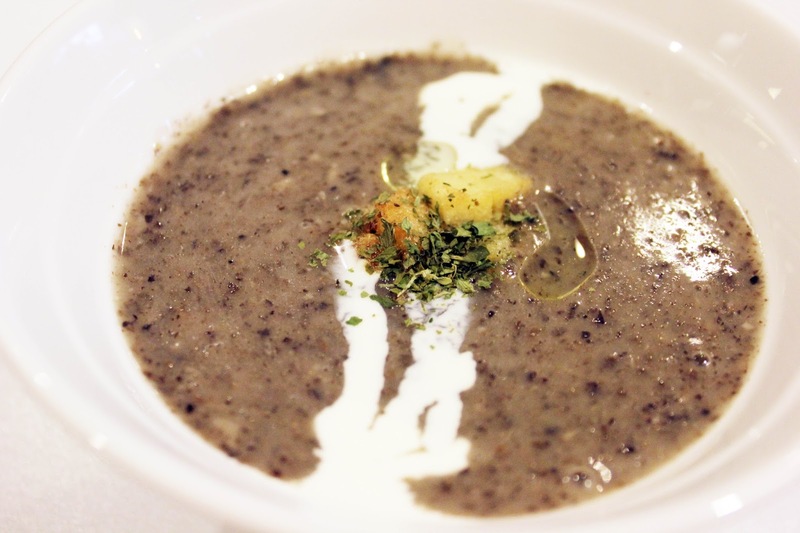 Just a side note, that I was able to taste the bits of mushroom soup (which was good) and it is generally the same compared to other restaurants that serves mushroom soup. Yummy, satisfying and pleasant way to start the meal! Other than the soup, one of the sides served was the garden salad. The salad also consisted a poached egg which i guess it's the "star" item of the dish that brings a whole new level to it. 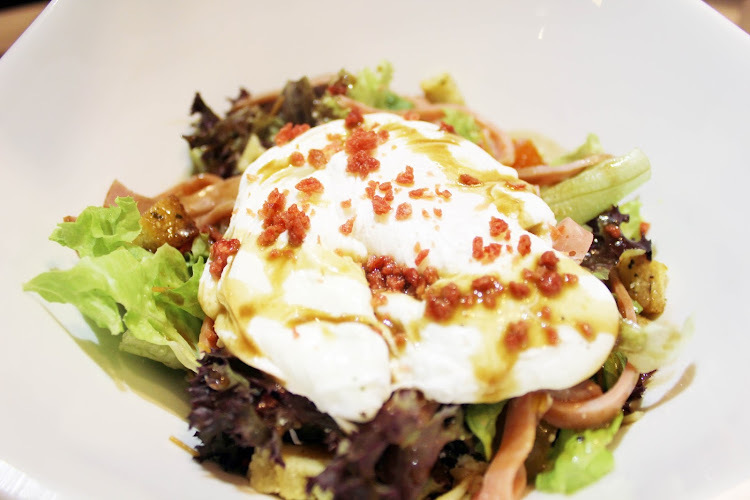 You are also to mix the egg together with the slices of hams & vegetables together with the fruity balsamic sauce. Not a vege person, but it I must praise the pleasing dressing of the dish upbringing the dish to appeal to it's consumers. Doesn't it look yummy to you? I usually have an expectation for fried calamaris. In case if you do not know, they are also known as "fried sotong". I like this dish a lot because it was super addictive. Every bite just made you want to go for another one. What's good about the dish is that it wasn't as greasy and oily as I thought. For a price of $8.90, I think its quite affordable for such quality of food and would serve as a perfect side to add on. The portion is able to be shared among 3-4 people. This has got to be one of my favourite sides among all the other 3 sides. They are soft juicy dory fish fingers wrapped in a secret recipe hand whisked beer batter. Oh god, the fish fingers tasted heavenly good and it was very appetizing. It's definitely a toothsome dish and you won't feel guility after eating this. Again, it's not so greasy and was evenly fried. Thus, I recommend you to order and try this dish too! With a dip of the orange sauce given, it enhances the taste of the fish fingers but still prefer without it. Still depends on personal presences. An unusual item that is not served on regular restaurants that I am willing to pay. The first main course was served and it is the Black Maiden. Plus points for the name of the dish, it is a dory fish topped with unique and delicious black pepper sauce. The sauce is designed to complement the dish and not to overwhelming it. The story behind this dish was rather interesting because dedicated to a girl in his life that didn’t like black pepper sauce. Best eaten together with concoction of coke and espresso. Though, I prefer mushroom sauce, I have to highly complement that the black pepper sauce was rich and extremely flavourful. Topping up to that the dish is also served with baked potato served with hot nacho cheese. Yums! Delicious marinated pork topped with homemade pineapple sauce. 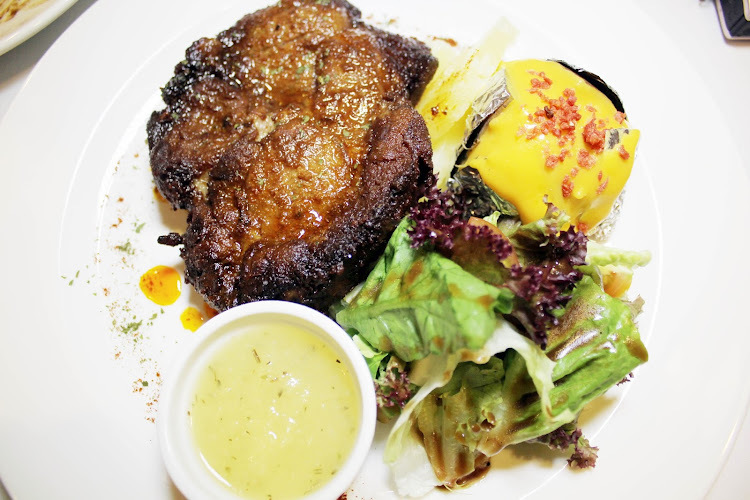 It really brings to me the homely feeling of the dish and I enjoyed this dish a lot. The pineapple sauce definitely goes well with the pork. 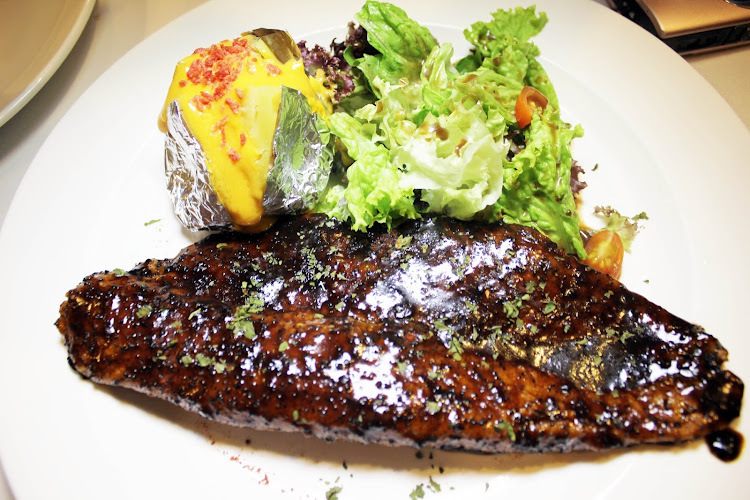 Again, this dish is also served with vegetables and baked potato with nacho cheese at the side. Can't be compared with the other main dishes because each has its own unique taste and this is one of them that I like the most! Wow, something that is definitely worth it's price! 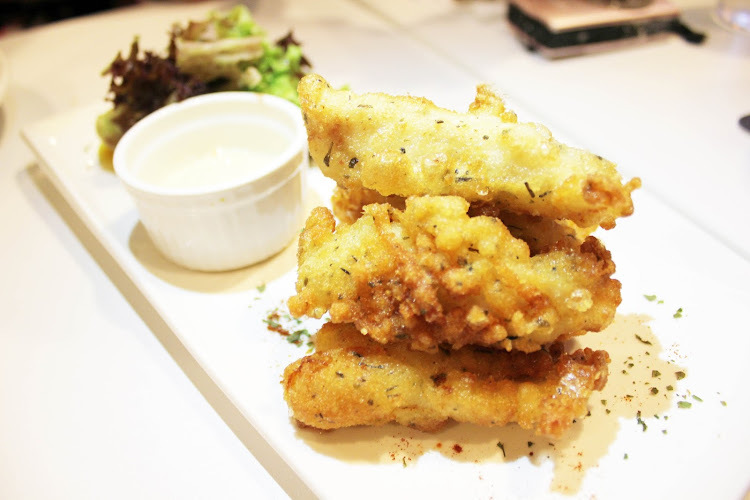 This dish can be compared to the fish fingers because it's like a larger and bigger version of it and they have same similarities as well. 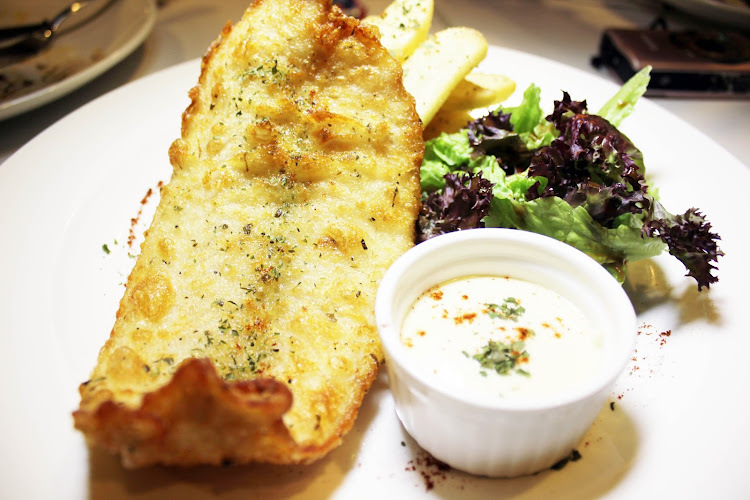 It can be served as a main dish if you feel like having the "fish fingers" as a main course. The entire dish is served with freshly cut fries and refreshing orange mustard sauce. I recommend this this because the texture of the dish was very soft and it wasn't fried too greasy and it was just right! The juices of the fish just literally spills out when you eat it! Yums! The steak was served medium rare, and every bite of it the meat just simply melts in your mouth, not exaggerating lolol! Extremely delightful, succulent! Exceptionally good, and I would also recommend you to order this. This dish was placed on top of a scoop of mashed potato. I LOVE mashed potato and they were flavorful and creamy that enhances the entire this dish! 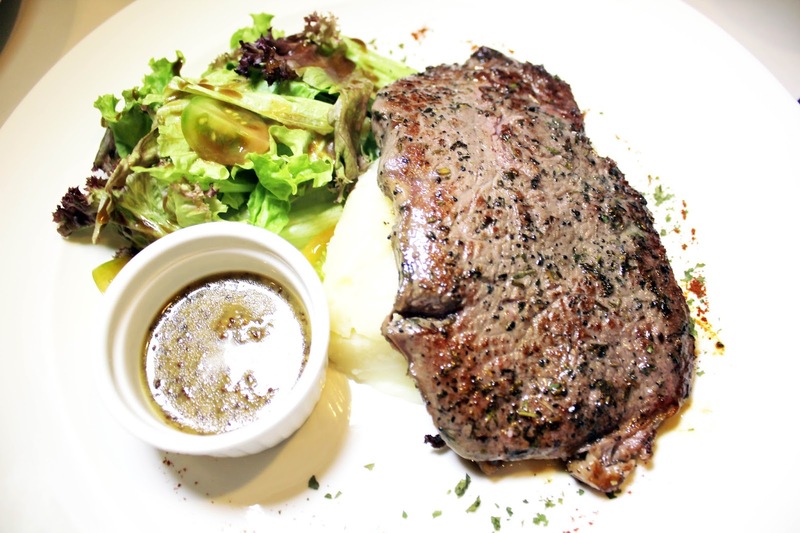 Overall, I love the juicy and mouth-watering meat. Something that you would like if you feel like having beef. Calling all salmon fans out there! Me too! *raise hand*! Yums, summing up to this dish if you love salmon you got to fall in love with this dish. 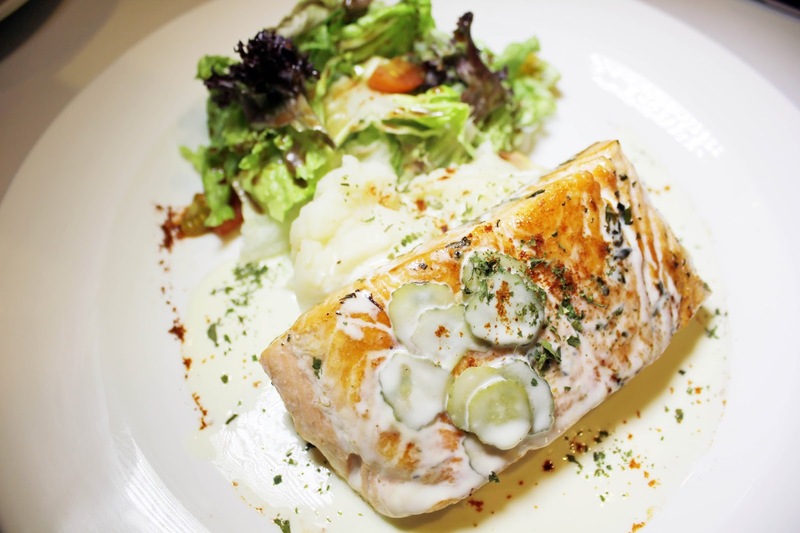 It is Norwegian Salmon fillet served with a herb-butter gherkin sauce on top of creamy mashed potato. It was scrumptious because the fish wasn't over-cooked and I must praise the cream sauce! It was really good and boosted up my appetite and wanting to go for more! 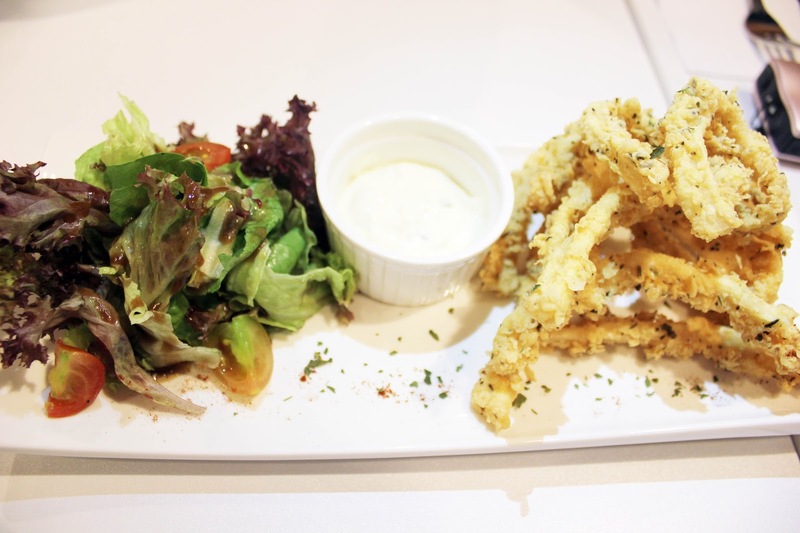 The portion of this dish was served at a decent amount and i recommend sharing with 2 persons, because you will get bored of this dish after a while! But it's still a great dish that I would order and share with my friends! 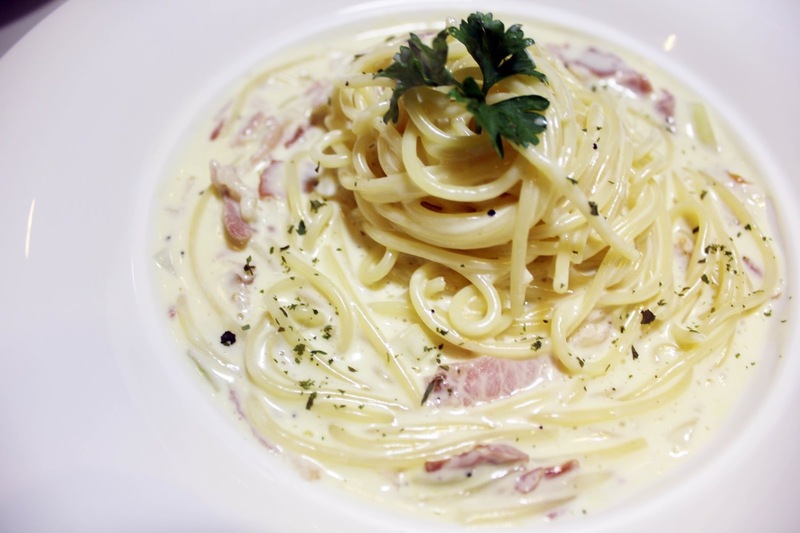 For a person that does not eat aglio olio, I feel that this dish was rather dry (though it's supposed to be served dry). Served with generous amount of bacons, despite tasted a little bit dry! I must praise the dressing of this dish. Overall, it just tasted like any ordinary aglio olio! Still prefer the creamy one! Another item that I'm willing to pay for the price of $13.90. With an affordable price you get such quality pasta! I'm biased to creamy food lah. #justsaying !! I love the entire dish and I think I am able to have a second serving of it. 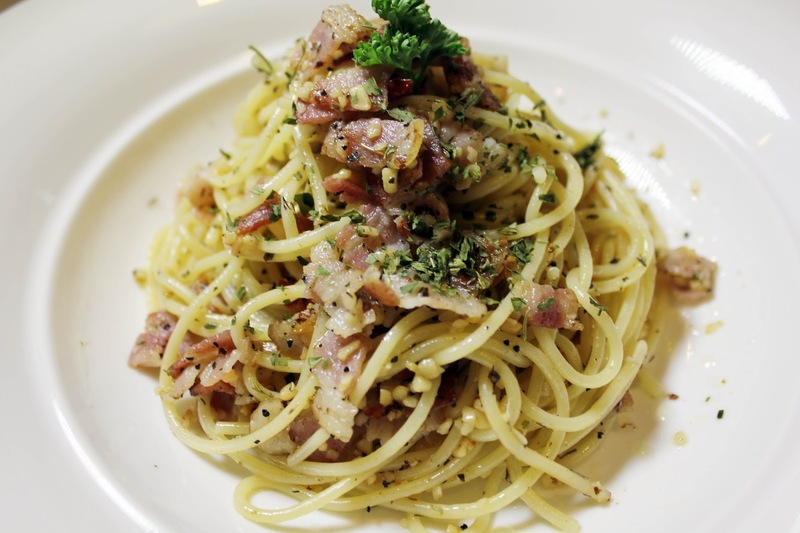 Again, it follows the concept of carbonara that serves bacon as well. 3 different types of cheese were used to make the sauce and they are Mozzarella, Parmesan and Cheddar. Overall, I feel that this dish was the most savory and remarkable. Finally we have come to desserts! 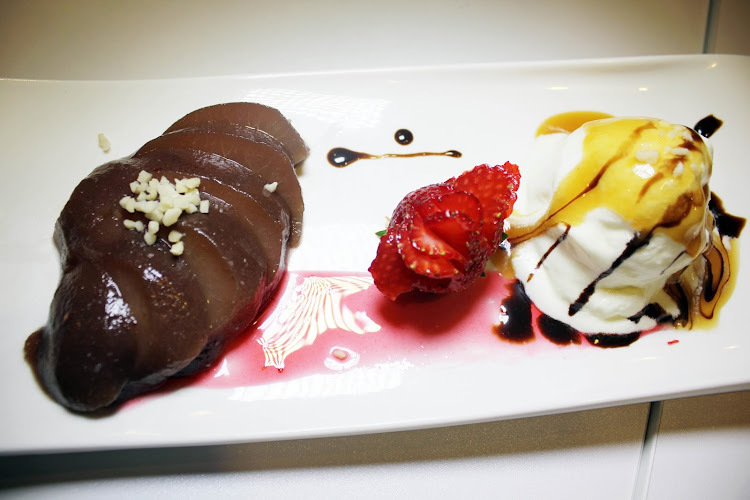 This dish is something I would recommend for sweet eaters. 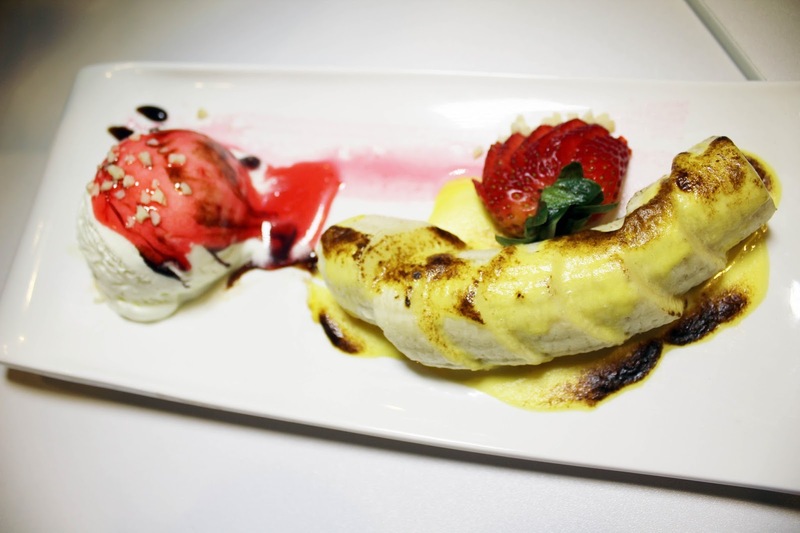 It is a twist of banana covered with their unique egg sauce! The banana was palatable and definitely appealed to everyone's likings! It is also topped with delicious caramel sauce Yums! It tasted so good that we have to order a second serving! The sweet elegant taste just simply just makes you fall in love with it! This dish seves as a specialty of their resturant. I heard it has undergoes several preparations such as it is prepared by boiling with the red wine for half a day then keep it chilled for a few days before being served. Seems like a tedious job to make this dish, but the taste is worth it. Major plus points for the design of the dish making it look very enticing and attractive. It is also served with a touch of vanilla ice cream with over chocolate sauce.